Nothing says autumn like TV premieres fire-hued foliage. And don’t be fooled by the still-balmy weather: Your window to catch those brilliant colors will be over before you know it. Consult this handy map, then plan your leaf-peeping road trips accordingly. Think the High Line, but bigger. This expansive bridge deck runs 1.28 miles long between Poughkeepsie and Highland, offering panoramic views of the Hudson River and its surrounding color-changing trees. You can easily spend a full day exploring the two towns—there are historic districts, waterfront walks and even a Little Italy on the Poughkeepsie side, where sandwiches from Rossi Rosticceria Deli are an absolute must. Just a short trip over the George Washington Bridge lies a scenic stretch that only gets prettier in the fall. Drive up the parkway to Rockleigh and back down to Fort Lee, where you’ll find a slew of excellent Korean restaurants. Bubbling crocks of soondubu at So Kong Dong or knife-cut noodle soup at Myung Dong Noodle House are perfect on a chilly evening. See Connecticut’s impressive leafscape (yeah, we’re calling it that) by both land and sea. The Essex Steam Train & Riverboat makes daily runs into the Connecticut River Valley, traversing 12 miles of prime leaf-peeping territory. Opt for the full two-and-a-half-hour train-and-boat tour, which also passes by local historic sights like the Gillette Castle and Goodspeed Opera House. Believe it or not, there’s some stunning foliage to be seen in…Staten Island. That’s right, the southernmost borough is home to a sprawling nature preserve with 35 miles of woodland trails, including one for biking. Make a pit stop at one of Staten Island’s famed pizzerias to fuel up for your walk—Pizzeria Giove, home to some of the city’s best wood-fired white pies, is just 15 minutes away by bus. Autumn doesn’t get more glorious than in the Pocono Mountains, where an eclectic mix of trees turn every color on the fall-foliage spectrum. With a sprawling 70,000 acres wrapping around the Delaware River, this park is especially great for water activities (canoes, kayaks and rafts are available for rental). Nearby Stroudsburg is home to RAW, the area’s first urban winery and cidery—because a good hard cider should also be on your autumnal checklist. 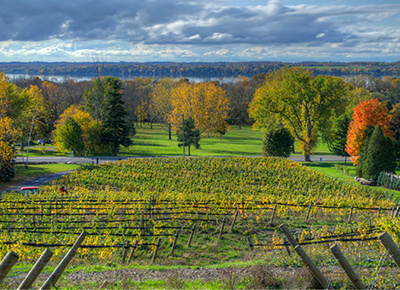 The Hudson Valley park is a stunner all year round but gets even more spectacular in the cooler months, as the mountainside turns shades of red, orange and yellow. The hike to the peak is a bit strenuous—there’s some rock scrambling involved—but the panoramic views from up top are worth the workout. Have time for a full-on weekend excursion? Set your Google Maps destination to this upstate park. Dubbed the “Grand Canyon of the East,” Letchworth gets only more beautiful in autumn, when the forests around its gushing waterfalls go from green to fiery red and orange. For the most Insta-worthy views, splurge on an hour-long hot air balloon ride—or unplug and get in sync with Mother Nature by renting a cabin for the weekend.